Hello! It is cold again today but sunny. I will list my accomplishments as usual. On 11/17, my "Cod and Daikon Tomato Juice Nabe" was selected to appear on recipe cards distributed at Jusco (AEON group supermarket). It is available during the month of December. On 12/7, I again won the Outstanding Performance Award at Asahi Food & Healthcare's diet recipe contest. They manufacture health care products, yeast extract, organic foods, and freeze-dried foods, such as chunky ingredients, aim to be a creator of wholesome living styles. I submitted my "Healthy Microwave Korean Burger". 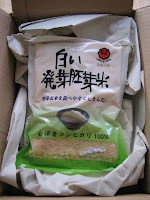 On 12/7, it wasn't a contest, but I won 2lb (1kg) of whole rice (which is rich in nutrients). We eat rice everyday, so to tell the truth, rice is the best prize next to cash!!!! 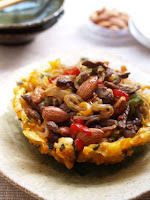 On 12/10, my "Stir-Fried Beef, Vegetable, and Almond in Pumpkin Basket" was introduced as the 1st place in the newsletter published by cookpad.com. 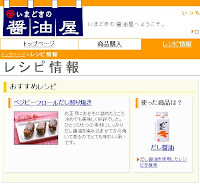 Every Wednesday, based on a certain theme, top three recipes are introduced there. On that week, the theme was "julienne". Thanks for selecting my recipe! 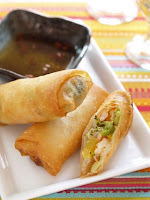 On 12/15, my "Thai-Style Shrimp, Broccoli, and Pineapple Spring Rolls" won the grand prize at Dole's fruit bottle recipe contest organized by Cookpad. Dole has newly released convenient fruit bottles, which are easier to save than canned ones! 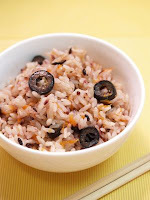 On 12/17, I won a bottle of olive oil by submitting my "Black Olive and Carrot Steamed Forbidden Rice". TRA NOI, online Italian grocery store has asked us for olive oil recipes to promote the usage of olive oil. On 12/18, I found my "Vegetable Dashi Teriyaki Beef Rolls" is introduced at Kamada's website. They have many dashi broth based soy sauce products and every year I submit them some recipes using their products when they organize contests. One of my recipes was luckily recommended! Now, the cleaner came to clean our bathroom. Year by year, stains are getting persistent, so I decided to ask the professional! We need to start our year-end housecleaning momentarily as well!!! I hope I can go to Shibuya to shop the Christmas sale this afternoon!